An SVBONY T7 W2568A high speed camera was placed at the Newtonian Focus of an Orion, 10 inch, f/4.8 Newtonian. 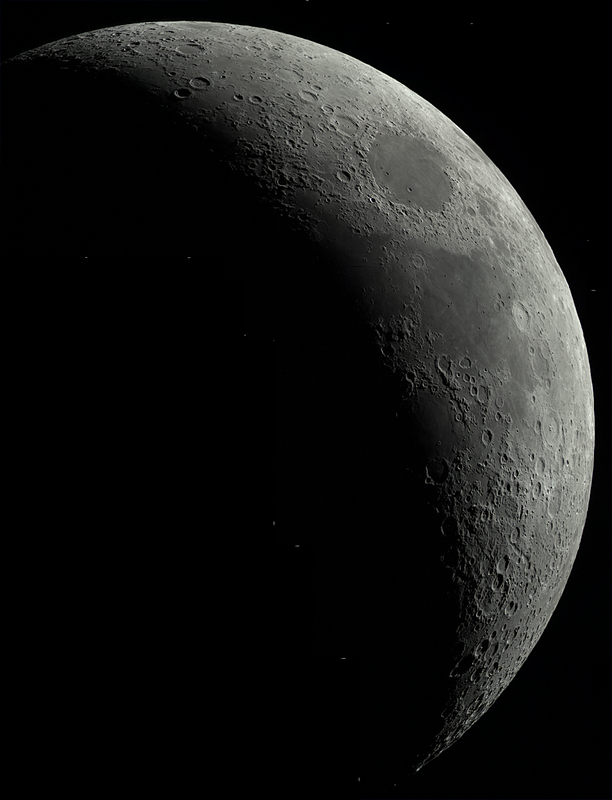 AstroDMx Capture for Linux was used to capture 6 overlapping, 1500 frame SER files of the 24.8% waxing, crescent Moon. The best 50% of the frames in each SER file were stacked in Autostakkert! 3 and stitched together into a single image with Microsoft ICE. The resulting image was wavelet processed in Registax 5.1. All three programs were running in Wine. The final image was post processed in the Gimp 2.9. Click on the image to get closer views.